I operate under the rock-solid belief that some dated elements of old movies –such as Keystone’s love of big silly mustaches–are, in fact, Awesome and should be embraced as such. Thus, my first viewing of The Sheik brought forth much rejoicing for its abundance of Awesomeness, and I’ve had a genuine fondness for it ever since. 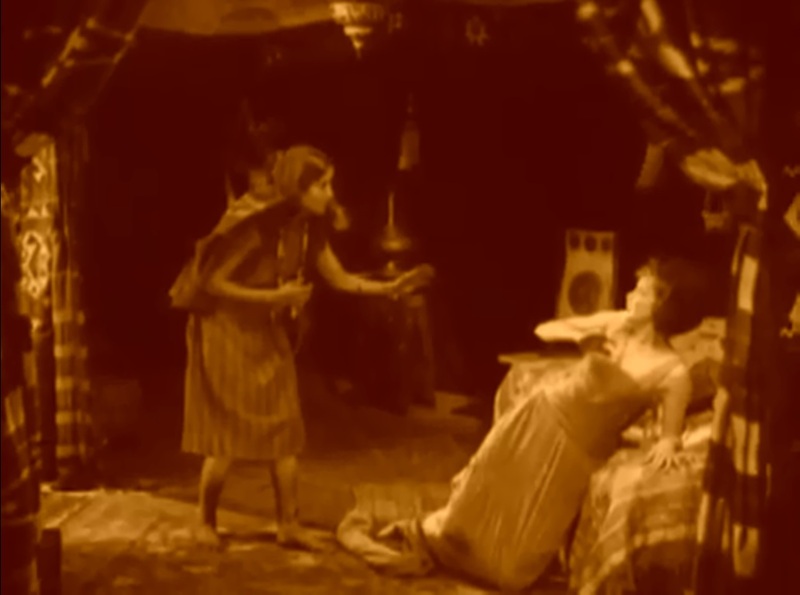 To be clear, if you’ve never watched a silent film starting with The Sheik is not something I’d generally recommend–it’s much better to get into some silent comedy and then a few top-notch melodramas first. Why? Well, to the inexperienced newbie this important Valentino film will seem like a textbook of silent “cliches” that everyone assumes ran rampant through early film. It’s bad enough that most people don’t give old films enough credit as it is. Now, as you’re suspecting it’s very easy to giggle at certain elements of The Sheik. But is it maybe a tad underrated? Is it a better showcase for Valentino than we might assume? Some background: The Sheik was the result of some cunning target marketing on the part of Famous Players–Lasky (which in the future would be called Paramount). At time, E.M. Hull’s torrid romance novel The Sheik was wildly popular. It was the Twilight of its day (or another novel whose name I don’t want to besmirch my innocent lil’ blog with; Many Pale Shades of Black will do). Studio heads reasoned that a film version of this book would be embraced by the large female demographic and rake in enough cash to, oh, buy everyone ten solid gold ukuleles (because 1920s). Not the least of which was pulling off this costume LIKE A BOSS. It was certainly a plum role, and it came with quite a few expectations. As the Sheik Ahmed Valentino would have to be handsome, magnetic, temperamental, virile, sultry, mysterious, indomitable, savage, strong, stealthy, imperious, dashing, exotic, foreign, Arabian, not white, sort of white, okay maybe white–and maybe a tad sensitive. His leading lady was Agnes Ayres, a Players–Lasky girl attracting notice at the time. She perhaps couldn’t radiate “fearless adventurous modern woman” quite like, say, Constance Talmadge could, but she certainly knew how to show fear in the presence of the Sheik. As so beautifully demonstrated here. The plot: Lady Diana Mayo, a Thoroughly Modern Woman with a “reckless spirit of daring,” defies all convention and decides to plan a tour “alone into the desert, with only native camel-drivers and Arabs!” (as an appalled matron exclaims via title card). As someone who had the good fortune of visiting Egypt a few years back, frankly, I’ve got to say that even today this truly…isn’t practical. The sweet Ms. Ayres pulls off the spirit of reckless daring about as aptly as skinny me pulling off the part of a professional football player, but that’s alright. While in a casino she sees Sheik Ahmed for the first time. He sees her for the first time. He finds her…intriguing. So intriguing that he later kidnaps her…snatching her from the back of the horse she’s riding. Forced into captivity with this handsome passionate he-man, she at first fears him, but when he does her no harm (aside from a forced he-man kiss) one thing leads to another and she begins to soften. Will Lady Diana fall for the Sheik? Will she get kidnapped yet again?! Will true love triumph in the end?! Will it turn out that the hot-blooded Arabian is actually European?!! One is the cinematography. This is a beautiful film, with the minimalist desert scenes (dunes, rows of palms, horsemen) and carefully posed tableaux that recall Romanticist paintings. 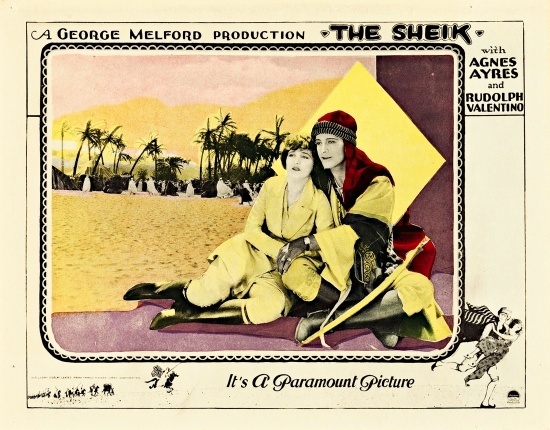 Director George Melford tried hard to make every frame of his film shout “EXOTIC!” The sides of the tents flap and quiver in the desert winds, the tents themselves are a tasteful riot of patterned cloths and Mid-eastern furniture, and many scenes are shot through drawn curtains and Moorish-shaped doorways. Another thing that stands out is Valentino’s charisma. Oh yes, he had it. I would define an actor having charisma if he merely stood in the corner of the frame, did nothing, yet somehow still made you feel he was Somebody, about to Do Something. Even in crowd scenes, you look at Valentino. And as far as his legendary looks went, well–I’ll just say that they will be at home in any time period from here to eternity. You probably didn’t notice, but he’s holding a cigarette in this photo. Then there’s the theme. The idea of a big dangerous exotic man going wild with lust for you and kidnapping you and forcing you to make love to him was quite the fantasy back then, apparently (you are an innocent maiden by the way). Women loved the notion of a take-charge “caveman” who won’t be ordered around. A Real Man, even an Exaggeration of a Real Man, sent their pulses racing. (In Harold Lloyd’s feature Girl Shy his character imagines himself using “caveman” methods to woo a ditsy flapper. It’s Awesome.) You might assume that having exotic Sheik Ahmed turn out to be European would put a damper on the excitement, but…in all fairness, it was 1921. From an ad for “The Sheik.” And honestly, do I really need to remind you that times were different back then? The casting in The Sheik sure helps the theme along. Ayres is quite petite. Her slim wrists and tiny hands conveniently almost disappear in Valentino’s strong grip, and he seems even taller and more masculine in comparison with her (okay, maybe I can understand the appeal a teensy bit). And the last thing that stands out is what everyone remembers. It’s…well, this. Valentino’s wide-eyed leering at Ayres is so out of the norm for him (heck, I’d say uncommon in films of the time) that some have speculated it was Melford’s idea. The Sheik’s eyes pop. His grin is almost pasted on. He laughs with cookie-cutter deliberation. And Ayres doesn’t help matters with her Fearful Damsel poses and theatrical attempts to flee him. But I gotta admit…it’s all pretty Awesome. Were it not for the whites of Valentino’s eyes showing all around his pupils, this film might not have the special place in my heart that it does today, I do declare. Modern viewers might assume that those backward people of the past swallowed this kind of overacting hook, line, and sinker. 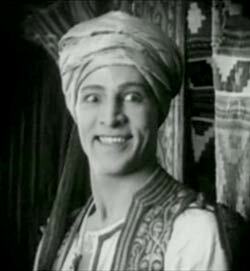 There were indeed some reviews praising Valentino’s performance, as in the Exhibitor’s Trade Review, Nov. 19, 1921: “Rudolph Valentino carries off the dramatic honors by his dashing impersonation of the hard-riding, violent love-maker, Sheik Ahmed Ben Hassan.” But there were also reviews like this one from Variety, November 11 of the same year: “Mr. Valentino…depicts the fundamental emotions of the Arab sheik chiefly by showing his teeth and rolling his eyes”. And sitting with his love in front of inexplicable yellow shapes. But let me add that in spite of all this wild posturing there’s one moment where Valentino transcends his role. At the 35 minute mark he begins to realize how he’s frightened Lady Diana, and feels twinges of remorse. He looks right at the camera–right at you–and for a moment you can see the phenomenon. And it’s those moments that arguably can still win him fans today. If you wish to see this photoplay of tempestuous love between a madcap English Beauty and a bronzed Arab chief (a 1921 Exhibitor’s Herald’s words, not mine) then break out that cheesy popcorn and go for it! (But only after carefully acquainting yourself with the silent era first.) It can offer a little something to everyone. If you want something fun, escapist, and full of beautiful scenery, this is the film for you. If you are a film snob and desire to use your favorite word (“campy”), this is the film is for you. If you are a gal wanting to see what all the Hot Valentino Hoopla was about, this is definitely the film for you. If you are a guy hoping to it laugh at what the Hot Valentino Hoopla was all about, ditto. 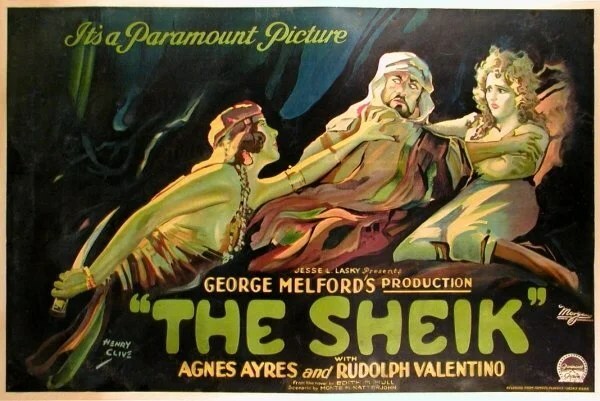 The Sheik may encapsulate some of the funniest cliches of the silent era…but few old films have done so with such charm. I wouldn’t quite call it a guilty pleasure, because heck, I experience no guilt whatsoever in enjoying it. It fulfills expectations, goes a bit beyond expectations, and will forever have its Moorish-shaped niche in film history. p.s. If you love this film (which of course you will), definitely indulge in the sequel The Son of the Sheik (1926) at some point. It is a fulfillment of what The Sheik was trying to be, and features a magnificent performance by Valentino. The young Italian certainly had It. 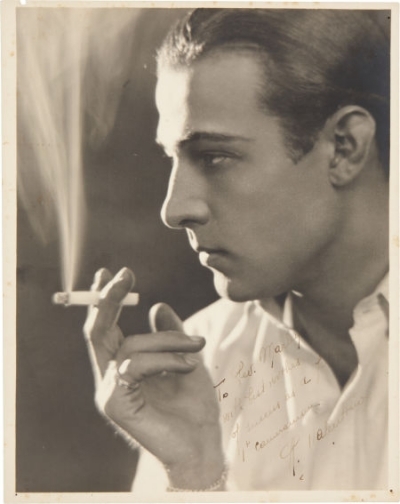 This entry was posted in Thoughts on Films and tagged 1920s, Adolph Menjou, Agnes Ayres, blogathons, E. M. Hull, romance, Rudolph Valentino, Sheik Month, sheiks, silent drama, The Sheik by Lea S.. Bookmark the permalink. I loved this post — and can’t help thinking of the “Harpo Marx” leer in relation to that last Valentino leer! 😀 I’m picturing that now myself! Thanks for reading. Wonderful — something for everyone as you say. I’ve seen it countless times but you inspire me to go back to it this weekend. And to think that Ivano and Rambova thought it would be a disaster. Looking forward to your next post! Thank you, working on it as we speak!